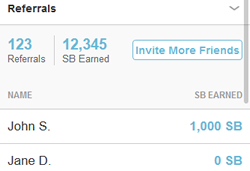 Referrals are a huge help when trying to earn points called SB from Swagbucks. The Referrals section will let you keep track who has signed up under your referral link and how many SB they’ve earned. After opening My Referrals you will see a list of the people that have signed up using your referral link. You can sort these by their sign up names, how many SB they have earned you, and on a larger screen by sign-up date. Remember, you earn 10% of whatever your referral earns for life (though, if you have been part of Swagbucks for a long time, you may have referrals that are under the old system of matching up to 1,000 SB of earnings). There may also be a signup bonus, though this does not show up under SB earned from your referral. If you have a lot of referrals (congrats!) Swagbucks will break the list up into pages. At the top of the Refferals section, you can see your total number of referrals and the total number of SB earned from your referrals. Next to this is a “Invite More Friends” button which takes you to the invite section. The more people people you invite, the more likely you are to earn referrals and a lot of SB.